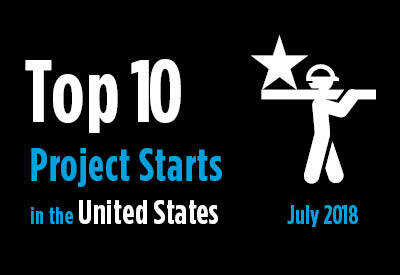 The accompanying table records the top 10 project starts in the U.S. for July 2018. There are several reasons for highlighting upcoming large projects. Such jobs have often received a fair amount of media coverage. Therefore, people in the industry are on the lookout for when jobsite work actually gets underway. And, as showcase projects, they highlight geographically where major construction projects are proceeding. Click here to download the Construction Industry Snapshot Package – July 2018 PDF. Click here for the July 2018 Industry Snapshot article, ConstructConnect’s July Nonresidential Starts -6.2% M/M; +9.5% Y/Y; and -2.3% YTD. Click here for the Nonresidential Construction Starts Trend Graphs – July 2018. *A square footage measure does not apply for alteration, some forms of industrial (e.g., petrochemical) and engineering/civil work. Data source and table: ConstructConnect.